Darjeeling Towns Club emerged as the champion of the fourth edition of Sikkim Veterans Football Tournament played here at Paljor Stadium. 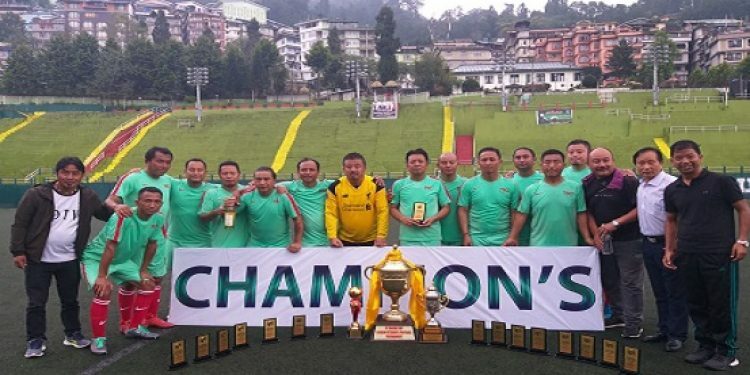 In the final match played on Tuesday, Darjeeling Towns Club outplayed the defending champion Darjeeling United Veterans 3-0. With the help of a goal by Finjo Wangdi Sherpa in the 31st minute, Darjeeling TC ended the first half with 1-0 lead. While defending champion players were trying to draw parity, Sanjay Sashankar extended the lead of Darjeeling TC to 2-0 in the 47th minute and sealed the victory of the team with his brace in the additional time of the match. Finjo Wangdi Bhutia of Darjeeling TC was awarded with the Man of the Match trophy, while Manjit Singh of Royal FC, Siliguri received the Man of the Tournament trophy. Fair Play trophy was awarded to Snow Lion FC, Gangtok. Transport Minister DT Lepcha was present as the chief guest of the final match, who also handed over cash prizes and trophies to its winner. The final day has also witnessed an exhibition friendly match between 50 plus veterans of Namcheybong and Dzongri FC, in which the former defeated latter by 3-1. The tournament was organised by one of the oldest and popular football clubs of the state, Dzongri Football Club, Gangtok. A total of 17 teams from different parts of Sikkim along with teams from Darjeeling, Kalimpong and Siliguri had participated in the tournament. Speaking to media after the match, Darjeeling TC officials expressed their happiness and satisfaction with the team performances. He stated that Darjeeling TC have former professional and national footballers from Darjeeling and have been participating in different veterans tournaments across the country. They congratulated the host Dzongri FC for regularly organising the veteran’s tournament and urged to continue with their efforts. “Such veteran tournament was also a good opportunity for former footballers of the region to meet each other and to have a wonderful time. Such tournament would also encourage youngster in football and other sports and to live a healthy life,” they said.